Pumiliornis tessellatus Mayr, 1999 is a tiny, wren-sized species, of which two skeletons were found in Messel (Fig. 11.2; Mayr 1999c, 2008a). 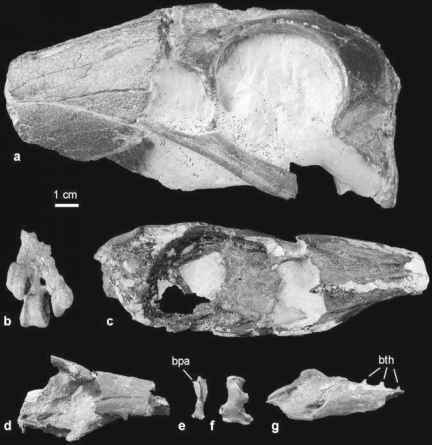 It exhibits a very unusual morphology in combining a long, probably schizorhinal beak with short and robust feet with a well-developed hallux. Other peculiar features include a far caudally positioned sternal keel, and the absence of an ossified supratendinal bridge on the distal end of the tibiotarsus. The bodies of the thoracic vertebrae bear marked lateral depressions. The proximal phalanx of the fourth toe is very wide and flat; in fact, this phalanx is much wider than the corresponding tarsometatarsal trochlea, which precluded arrangement of the fourth toe in an anterior position and indicates the presence of an at least semizygodactyl foot. Although the phyloge-netic affinities of Pumiliornis are unresolved, it shares several characteristics with Eocuculus (Sect. 11.5; Mayr 2008a). Even greater are the similarities between Pumiliornis and a small bird from the early Eocene of the Danish Fur Formation, which was described by Bertelli et al. (2009). The exceptionally well preserved skeleton of the latter species was first studied by Kristoffersen (2002a) and lacks the wings, pectoral girdle, and sternum (see also Fig. 7 in Dyke and van Tuinen 2004, who introduced the nomen nudum "Morsoravis sedile" for this bird). The Danish bird agrees with P. tessellatus in the presence of a schizorhinal beak, lateral excavations on the body of the thoracic vertebrae, a fairly long tibiotarsus, the morphology and proportions of the tarsometatarsus, and the robust feet with a wide and flat proximal phalanx of the fourth toe (Kristoffersen 2002a). Unlike in Pumiliornis, there is, however, an ossified supratendinal bridge on the distal tibiotarsus of the Danish fossil. The Fur Formation fossil was assigned to the Charadriiformes by Kristoffersen (2002a), Dyke and van Tuinen (2004), and Bertelli et al. (2009), but the evidence therefore is weak and the shared similarities (e.g., the vertebral excavations) may well be plesiomorphic. In addition to the presence of an at least semizygodactyl foot, the bird from the Fur Formation shares an unusually low number of scleral ossicles with extant Cuculiformes (Bertelli et al. 2009). Because some current analyses support a close relationship between the Cuculiformes and core-Gruiformes (Ericson et al. 2006; Hackett et al. 2008), the possibility that Pumiliornis and the Danish fossil are early stem group representatives of the Cuculiformes with plesio-morphic "charadriiform" and "gruiform" features should be scrutinized in future studies.